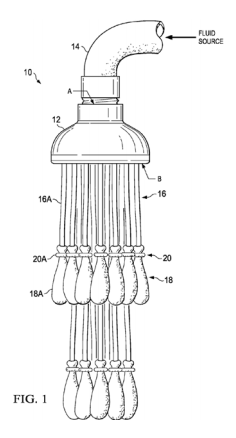 I previously wrote about the case that involves Telebrands’ patented balloon-filling-toy. U.S. Patent No. 9,051,066. The case is one of the first lawsuits involving a post-AIA patent. Preliminary Injunctive Relief: Even before eBay, courts applied a four-factor test to determine whether to award a preliminary injunction to stop ongoing infringement pending a final judgment in the case. (eBay changed the rule for permanent injunctive relief.). A decision to grant or deny a preliminary injunction is within the sound discretion of the district court, based upon its assessment of four factors: (1) the likelihood of the patentee’s success on the merits; (2) irreparable harm if the injunction is not granted; (3) the balance of hardships between the parties; and (4) the public interest. The factors are slightly different than those considered for permanent relief in eBay. Most importantly, at the pre-trial stage, the patentee has not established that it will actually win the case and be eligible for any remedy at all. Thus, the Preliminary Injunction factors include consideration of who is likely to win. The Prelminary Injunction factors also eliminate the eBay factor that “remedies available at law are inadequate to compensate for the injury” by rolling that factor into the irreparable harm consideration. A fifth element that is not usually stated in the test is that the patentee must also be willing and able to post a bond to the court that will compensate the enjoined party if it turns out that the injunction was improper. Rule 65(c) requires a bond “in an amount that the court considers proper to pay the costs and damages sustained by any party found to have been wrongfully enjoined or restrained.” Fed. R. Civ. P. 65(c). Two important aspects on appeal: (1) A district court’s PI order (either grant or denial) is immediately appealable even though it is a non-final interloctutory order. 28 U.S. Code § 1292. (2) Because district courts are given discretion in awarding preliminary injunctive relief, those judgments are given deference on appeal. PTAB Interplay: As with so many US patent lawsuits, the case involves a parallel AIA-trial. Since the patent at issue here is a post-AIA patent, the challenger was able to file for post-grant-review (PGR). Patentee files the lawsuit and requests a preliminary injunction. District court awards PI – after considering but rejecting invalidity challenges by defendant. Defendant files PGR petition – making the same invalidity arguments (indefinite and obvious). USPTO initiates PGR – finding claims likely invalid as obvious and indefinite. As noted above, a key factor for awarding preliminary relief is the likelihood that the patentee will ultimately win the case on the merits. Although a patent is presumed valid, a challenger can overcome this hurdle by showing that the patent is “vulnerable” to a specific validity challenge. The court has also termed this as finding a “substantial question concerning the validity of the patent.” A seemingly reasonable approach here would be to say – “If the PTO concludes that claims are likely invalid, then those claims are probably vulnerable to being found invalid.” Here, the court does not follow that approach and – in fact – does not even mention the PTAB initiation decision in its discussion of the aforementioned vulnerability. (The court does state that the PTAB has taken action, but does not appear to draw any conclusions for this case from that parallel proceeding). Implicit holding here is that the PTAB initiation of a PGR Does not negate a preliminary injunction. Rather, the appellate panel walked through the district court decision and found that (1) someone of skill in the art would likely understand the term “substantially filled” and thus it is not indefinite; and (2) the district court did not err in holding that prior art associated with filling an endoscopic balloon was not analogous or pertinent to the problem of filling toy water balloons. Motivated to Consider vs Motivated to Combine: The Federal Circuit is still working through how to deal with the analogous arts test post KSR. Here, the court ultimately found there was no ‘motivation to combine’ the prior art since one of the references was not ‘analogous art.’ In at least pre-KSR tradition, these were separate inquiries within the obviousness process outlined in Graham v. John Deere. The analogous arts test has long been thought of as part of the initial factual Graham inquiry – identify the scope and content of the prior art. Under the doctrine as explained in Clay, the court limits the scope of prior art only to references that a worker may have been motivated to consider. These are generally thought of as references in the same field of endeavor or addressing similar problems as those faced by the inventor. Of course, just because two prior art references are within the same field does not mean that the worker would have been motivated to combine the elements of references in the way claimed by the inventor. Thus, traditionally, the motivation to consider a reference is a unique and different inquiry than that of the motivation to combine the elements of multiple references. Here, the court appears to mix them together in a way that adds to confusion in the inquiry rather than offering clarity. Now, maybe it makes sense to throw-out the old Graham v. John Deere structured approach, but that should be an explicit process rather than a set of (perhaps-unintentional) undermining decisions. Anyone offering odds that the final decision of the 3 PTAB IPR APJ’s* will find it to be beyond the ordinary skill of a POSITA to fill plural balloons faster by using plural rather than single nozzles? Any doubt what the Sup. Ct. would do if they ever get their hands on this case? There would be more verbal water balloons thrown than a Shriner convention. *There would be no IPR decision inconsistency with this D.C. decision, because a patent preliminary injunction decision does not require a patent validity decision. However, it is supposed to consider if the defendant has offered a viable potential defense. But, what is a “substantially filled” balloon? Its fill capacity is highly variable, varying by some amount of stretch up to some rupture point. Also, how does the “ONE of the containers” limitation comport with the fact that there is no claim requirement for the containers to be the same? Oh well. Not my problem. Not to be ‘that guy’, but man, I used to do this when I was a kid. We used a 3-4 foot long water hose with fish tank tubing pushed through and then siliconed up. It looked like a fish spine and ribs (flounder spine and ribs). We got like 20 water balloons at a time filled up. That was back in.. woah.. mid 80’s? I feel old now. If you have any documentary evidence, you might want to contact the defendants here. Wish I did, I would. But it was just something us kids came up with to speed up making the balloons. It didn’t actually speed things up, it took longer to make the hose, stop up the end, seal it, poke holes in the hose with an ice pick, push the tubing through, poke holes in the tubing so the water in the hose entered the tubes, seal the tube entries, put the balloons on, wrap the rubber bands to keep them from shooting off under pressure… All that took a long time. traditionally, the motivation to consider a reference is a unique and different inquiry than that of the motivation to combine the elements of multiple references. Here, the court appears to mix them together in a way that adds to confusion in the inquiry rather than offering clarity. I agree that the court appears to have mixed these two inquiries into one here, but I think that the confusion is likely harmless. When I look at this case, I feel like the father in the parable of the prodigal son (Lk 15:23–24) “Let us eat and make merry; for this my son was dead, and is alive again; he was lost, and is found.” I had thought that the analogous arts doctrine was essentially dead in U.S. law. When it poked its head up in In re Natural Alternatives, I regarded it as a fluke with no future application. Here, however, is a second case in less than 5 months in which an obviousness rejection has been shot down for nonanalogous arts. Dare we hope that the CAFC is trying to revive this doctrine? Incidentally, here is what I really hope. The CAFC has been very willing recently to shoot down a verdict on the grounds that party X had a burden that was never addressed (e.g., Dynamic Drinkware or Natural Alternatives). Analogous arts should be a preliminary inquiry to absolutely every obviousness challenge. The test for analogous arts requires that one specify the problem that a supposed PHOSITA was attempting to solve by combining the references. Therefore, if the proponent of obviousness does not identify a problem, the challenge necessarily fails for a missing element of prima facie obviousness. I think that making this a requirement would bring a healthy dose of methodological rigor to the obviousness inquiry. In other words, problem/solution analysis already exists in U.S. law, but it has been allowed to languish. I want to see the CAFC force problem/solution back into the ordinary course of obviousness thinking. Well, Greg, give the travesty that is the PTAB’s jurisprudence in this area, we are probably going to see a lot more reversals that find obviousness merely because two references exist in the same field of endeavor. What the PTAB does is declare a proceeding initiated, then effectively ask the patent owner to prove non obviousness as if the burden had shifted. The PTAB (and until recently) the Federal Circuit simply turn a blind eye to patent owners who complained that a prima facie case has not been established if no reason or evidence is advanced to combine the references in the way the patentee had combined them. Without this reasoning as a hard and fast requirement, what we have is simply using the claim to find all the elements in the prior art, and the declaring the patent claim at issue is obvious because of some incantation stripped from KSR . Perhaps this is merely a matter of procedure. The defendant could have asked the district court to reconsider based upon new evidence (the finding of the PTAB) rather than ask the appellate court to reverse on evidence not presented to the district court. The trial court still had jurisdiction at the time of the PTAB finding so a motion to reconsider would be reasonable. A Federal Circuit reversal would reflect negatively upon the trial judge; unfairly so because it was based on something not presented to the judge. The interesting question becomes how the Federal Circuit would weigh the PTAB finding in reviewing a denial of a motion to reconsider or a reconsidered and denied PI motion.
) the district court did not err in holding that prior art associated with filling an endoscopic balloon was not analogous or pertinent to the problem of filling toy water balloons. Just for the record, the claims aren’t limited to “toy water balloons.” The title of the patent is “System and method for filling containers with fluids” and the claims are highly functionally descriptive and far broader than the pictured embodiment shown above. wherein the apparatus is configured to fill the containers substantially simultaneously with a fluid. Query how the usual reasoning applies to these claims: (1) what does the art teach about a container-filling mechanism similar to this but which teaches only a single container and (2) what does the law say about the obviousness of improving upon a singular means by using a pluralilty of such means? I think the Federal Circuit may be recognizing that the PTAB is operating at a much lower standard of proof for invalidity then required by the courts. Perhaps they should have said that. Is there such a thing as an implicit slap in the face? Hmm, given the metaphorical nature of a “slap in the face” delivered by the issuance of a written decision, the differentia between what would constitute an implicit one and a so called “explicit” one would likely require the presence of the word *SLAP* itself in one form or another. Good point. I think that Ned’s reading here is quite plausible. Just because the PTAB (using a lower threshold to prove invalidity) thinks it more likely than not that a claim will fail does not really contradict the District Court’s conclusion that the defendant is unlikely to succeed (under a higher threshold for proving invalidity) at its invalidity challenge. It is possible, in other words, for both the D. Ct. and the PTAB to be correct in its respective assertions. It would have been better, however, if that is the CAFC’s thinking, for the CAFC to have said as much. Implicit holding here is that the PTAB initiation of a PGR Does not automatically negate a preliminary injunction. MM, what are the words you have been using about fanatics? “Biased, bigoted, unhinged, epithet hurling, goofball mane E acts?” Well the PTAB has been gaining a reputation. That is probably more accurate as an inherent holding.